Lewis Carroll’s beloved children’s classic comes to life with over one hundred whimsical, eccentric and darkly humorous wood engravings, all created by the ‘Mad Hatter’ of Canadian graphic arts himself, the award-winning George A. Walker. 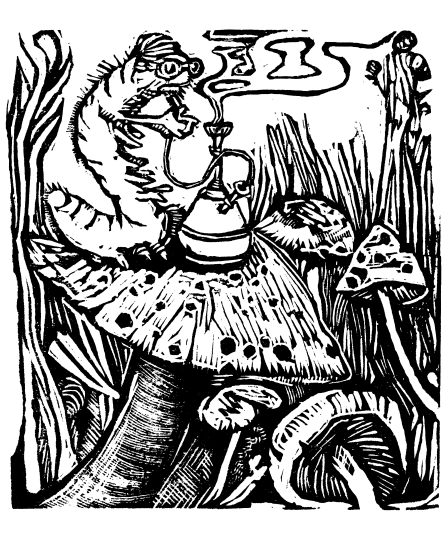 In 1980, George A. Walker was all of nineteen years old and starting his first year at the Ontario College of Art when printmaking instructor Bill Poole approached him with a crazy idea: to create ninety-six wood engravings for Poole’s limited, letterpress edition of Alice’s Adventures in Wonderland. The project took ten years to complete and only 177 volumes were ever made. It was the very first entirely Canadian publication of Carroll’s beloved classic. Now Walker is an internationally acclaimed artist and the Porcupine’s Quill has finally made this unique artwork, alongside the book that inspired it, widely available to layreaders -- this time with several extra illustrations not present in the earlier edition. Walker’s engravings are as playful, surreal and downright provocative as ever, offering a new and darkly energetic interpretation of Carroll’s masterpiece and subtly toying with Sir John Tenniel’s famous nineteenth-century illustrations. Wood engraving is a meticulous, delicate art form with a history spanning hundreds of years, and Walker works in the same tradition as Tenniel himself whose illustrations were made into wood cuts by the Dalziel brothers for the first printing of Alice’s Adventures in Wonderland in 1865. This 2011 edition celebrates Alice’s spectacular adventures as well as her equally spectacular artistic heritage with a uniquely modern twist -- by the man now known as the ‘Mad Hatter’ of Canadian graphic arts. The Porcupine’s Quill has just released a wonderful new edition of Alice in Wonderland lavishly illustrated with wood engravings by George Walker and with a new introduction by Alberto Manguel. Following in the tradition of the Cheshire Cat Press edition published nearly 25 years ago by Bill Poole, George Walker and Joseph Brabant (one of the finest examples of a Canadian private press book), the story is as beautiful woven through the illustrations and design as it is through the magical words we are all familiar with. Walker’s edition of Alice’s Adventures in Wonderland (Cheshire Cat Press, 1988) announced forcefully his precocious talents as a printmaker and book artist. His enormously expressive woodcut illustrations paired with master letterpress publisher Bill Poole’s sensitive handling of type, printing and binding, comprised one of the finest hand-printed volumes ever produced in Canada. Alice has just been issued in a trade edition paperback by Porcupine’s Quill in Erin, Ont. ‘Each image offered here provides evidence of its creation; there is a reminder, with each turn of the page, of the hand and thought that guided each groove. Walker’s ability to impress such great detail (as in the grain of both the fur of the Cheshire Cat, and the branch upon which he is perched) in a print made with woodblocks is remarkable.... At the heart of this book is the art of the book, pages kissed by poetic samples of Carroll’s writing and bound using artisan techniques onsite at The Porcupine’s Quill headquarters. It is a high-quality, collectible edition in which fans of the Alice stories, bibliophiles, and young readers will delight. There are books so intimately associated with their illustrator that they can hardly be thought of independently. The Alice books are of this kind. John Tenniel’s magnificently detailed, utterly realistic depictions of Alice’s dream world are as much part of Alice as the immortal characters that live there, so much that in the long line of artists that have succeeded him (and preceded him, if we count Carroll’s own watercolours in the manuscript of Alice’s Adventures Underground) not one has displaced or come near him. Alice is Tenniel’s Alice, the Mad Hatter is Tenniel’s Mad Hatter and it would be impossible to imagine, even before breakfast, a Duchess that did not resemble Tenniel’s Duchess. Alice’s books are tales told in dreams, and in dreams no reality stands for ever fast. Fluid and changing, dreams become something else both in their own time and in their telling, and every time we go back to them, their landscape has been replaced by another, but not quite different landscape. Fall we must, but the course of the fall will slightly alter every time we come to what we believe is the same rabbit hole in the same daisy-dotted meadow. 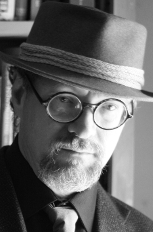 George Walker has assumed the right of every reader of Alice to translate the story (and the illustrations) into an illustrated story of his own. Tenniel saw Carroll’s text as a series of tableaux or set episodes, moments in the narration that could stand on their own, like scenes in a diorama. Walker instead has followed a more lively course in which the speed of the action allows no time for standing still and posing (much like the time of Through the Looking-Glass, where one must run very fast to remain in one place.) Glimpses, snapshots, details of larger scenes tell of Walker’s reading, a reading that follows Alice’s frantic pace, far from Victorian sobriety, from madness to greater madness. In Walker’s version, the tableaux that the adventures traditionally elicit are exploded into dozens of fragments, like those that seem to scurry through medieval manuscripts and early printed books. Here is the rhythmic lobster quadrille, among a splendid aquatic fauna that includes a busy whiting and its shoe. Here are the cards and their monarchs dressed down as earthy variations of their more noble models. Here is the bestiary that Carroll imagined, animal and human, but with a solid, children’s primer-like reality, closer to the picture-books of Carroll’s time than to the political caricatures of Punch in which Tenniel excelled. And Alice herself (as we had forgotten) is not, as Tenniel imagined, a never-varying heroine, but many, a multitude of Alices changing through magic potions and through crises of identity: sometimes schematic and ghostly, sometimes full-bodied and powerful, sometimes with the borrowed traits of one of Wonderland’s strange creatures. Woodcuts are, of all the illustrating techniques, the one that perhaps shows most confidence in its own language and matter. It acknowledges the mark of the chisel and the veins of the wood, it accepts and assumes its material self, it does not pretend to suffuse its own nature with that of the subject it is depicting, it allows itself to remain true to its own character, while performing its illustrative role for the sake of the story. Woodcuts never deceive the viewer. It is therefore absolutely fitting that Walker should have chosen this technique for illustrating Alice, because Alice too, in spite of everything, remains true to her dreamlike self, to her reality as dreamer, and even in her most alienating moments never forgets that her essence is flesh and bone, not fantasy, and that beyond the page (and the illustration) lies a human being who will wake up when the last word (and trait) of her story are done. On the 27th of January, 1983, Bill Poole, George Walker and I met for lunch at Chives on Queen Street in Toronto. Bin is the kind of chap who remembers birthdays and he was quick to remind us that it was Lewis Carroll’s 151st birthday. We got to talking about Carroll and by the time lunch was over we had decided to publish an edition of Alice’s Adventures In Wonderland. George would do the illustrations; Bill would print the book; and I would be the editor. We then went about our appointed tasks, meeting for lunch about once a month for the next five years to review our progress with the book. There were always two or three pages of freshly printed text to proofread; we would discuss where the illustrations should be placed; and our waitresses soon got used to serving lunch on tables piled high with wood engravings, sketches, books and pageproofs. George cut more than one hundred and fifty wood engravings. At times two or three engravings competed for the same space on a page and some hard choices had to be made. Ninety-six were eventually used. One interesting feature of the book is that George tried, as often as possible, to depict episodes which had seldom or never been illustrated before, like Elsie, Lacie and Tihie at the bottom of the treacle well in the Dormouse’s story. My task was to decide which of the variant texts of the book we would print, and I finally settled on the text as it read in copies printed in 1897 just before Carroll’s death. These copies known as the eighty-sixth thousand copies were the last ones printed under Carroll’s supervision. We followed the 1897 text faithfully and readers interested in such details will note, for instance, that the words ‘salt water’ are unhyphenated at page 16, there is no bracket after the declension of ‘mouse’ at page 12, and there are missing quotation marks at page 57 when the King is talking to Alice about the Cheshire Cat. We also retained Carroll’s idiosyncratic spelling of words like ‘sha’n’t’ and ‘ca’n’t’. Bill set the type by hand and in the course of doing so he noted that Carroll had a predilection for words with the letter ‘t’. (We offer no explanations, Freudian or otherwise.) Bill also did all the printing by hand with all the risks which that entails. Somewhere there is a letter ‘f’ with a partly broken stem; it broke during the printing as the heavy press slammed down once more. Bill noticed it much later but will not say where! He printed the illustrations directly from George’s wood engravings, unlike Carroll’s printers who did not use Tenniel’s woodblocks but worked instead with devices like electrotypes taken from the woodblocks. Thus was the tale of Wonderland retold once again. Retold, by the way, for the first time in Canada. We hope the reader will like it. How the story came to be told in the first place is another matter. On the 4th of July, 1862, Carroll, who was then a thirty-year-old Mathematcial Lecturer at Christ Church and whose real name was Charles Lutwidge Dodgson, went on a picnic near Oxford with his friend Robin Duckworth and with Alice, Lorina and Edith Liddell, the children of the Dean of Christ Church and Mrs. Liddell. They took a boat at Folly Bridge near Christ Church and rowed up the Isis, as the Thames is known at Oxford, to a place called Godstow three miles away where they picnicked and Carroll told them a story. There had been many such picnics before, and one of the highlights of these outings was the stories Carroll would tell. The story he made up on the 4th of July, 1862 was all about Alice Liddell herself, and how she followed a white rabbit down a rabbithole and met up with all sorts of strange adventures. It must have been an even better story than usual because at the end of the day Alice asked Carroll to write it down for her. He agreed to do so and produced a little book called Alice’s Adventures Under Ground which he gave Alice as a Christmas present. It was a book of about ninety pages in which Carroll included not only the story he had told on the 4th of July, but also other stories which he had told the Liddell children on other picnics. It was all in his own neat handwriting and he even illustrated it, although by his own admission he was not much of an artist. Alice’s Adventures Under Ground immediately found favour with the Liddells and they showed it to their friends, who were equally enthusiastic. 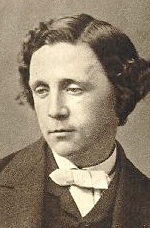 Greville MacDonald, the son of George MacDonald who wrote At The Back Of The North Wind and other books for children, was one of those who read it. Greville was about ten years old and he wished there were sixty thousand volumes of it. Encouraged by all this, Carroll decided to publish the story and reach a wider audience. The book which resulted was called Alice’s Adventures In Wonderland. It appeared in 1865 just in time for the Christmas sales. It was a much longer book than Alice’s Adventures Under Ground, being nearly two hundred pages long. In fact, Carrol had extensively rewritten Alice’s Adventures Under Ground taking out many references to the Liddells and to events at Oxford which were considered too personal to be left in a book which was to be sold to the public. He also added entirely new episodes with new characters like the Cheshire Cat, the March Hare and the Hatter who had not figured in Alice’s Adventures Under Ground. An advertisement for the book in November of 1865 predicted that it would be sought after as one of the most popular works of its class. This certainly proved to be true. Over one hundred and fifty thousand copies were sold just in Carroll’s lifetime and, in 1898, the year of his death,Alice’s Adventures In Wonderland was voted the most popular children’s book of the day. Since then, Alice’s Adventures In Wonderland has been reprinted thousands of times. It has been imitated and parodied. It has been used to advertise everything from beer to refrigerators. It has been dramatized, filmed and choreographed. It has been translated into almost every known language, even into languages like Swahili and Marathi. One wonders, indeed, what Carroll would think of it all. Bill, George and I like to think that at least he would be pleased with our work. Lewis Carroll was born on the 27th of January, 1832, as Charles Lutwidge Dogson at Daresbury in Cheshire, England. Carroll is best known for his children’s books Alice’s Adventures in Wonderland and Through the Looking-Glass, which quickly became international successes and to this day inspire films, art, and research. Other famous works of his are the poems ‘The Hunting of the Snark’ and ‘Jabberwocky’. Carroll had a prodigious talent in mathematics, logics, word play and philosophy, and he spent most of his life teaching mathematics at Christ Church, Oxford. He died at the age of sixty-five on January 14th, 1898, in Surrey, England. Today there are societies around the world dedicated to the study of his life and appreciation of his writings.